Today is the Chinese New Year and a friend of ours was hosting a celebratory dinner/housewarming party. I wanted to make something at least remotely traditional and didn't have a lot of time. 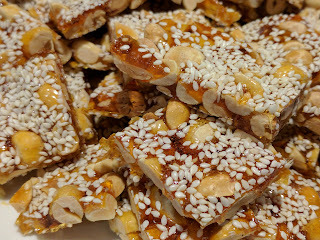 A quick Google search yielded various cookies and then I found a recipe for Chinese peanut candy. I've seen this stuff in Chinatown, little batons wrapped in plastic, always factory-made. I'd never even thought about making it from scratch. But it was so easy! The peanuts are roasted and then mixed with salt and five spice powder, then put on a baking sheet with sesame seeds and red pepper flakes. Then the sugar is cooked with water and a little vinegar for 16 minutes and poured over the top. When the sugar is poured, the candy is sprinkled with more sesame seeds and, after a few minutes, cut into pieces. A few notes to self: the amount of the sugar wasn't enough, so while I doubled the recipe I should have tripled the sugar portion AND maybe use a little less of the red pepper flakes. It has a kick. Another gift I brought for my friend was paté, made from a combination of chicken, duck and turkey livers. I'd saved a bunch of livers from all our various roast birds and ended up with 18 ounces of liver. That, when cooked with the shallots, garlic and duck fat, made two 12-oz loaves of paté. I made the paté a few days ago, using this recipe, and had frozen some of my share for later meals. I think my friend may do the same. Twelve ounces is a LOT of paté. The other project for today was making turkey stock. I now have all the stocks I need to make Gooduckey soup, which I think I'll do tomorrow. I have a ton of turkey meat, some duck and some goose meat to go with all the stocks. I just want to pick up some more exotic mushrooms and then I'll have everything I need. I didn't can the turkey stock yet; I'll take what I need for the soup and then can the rest.